With proper handling, trophy alligator gar can successfully be caught and released for future anglers to enjoy. Alligator gar are the largest scaled freshwater fish in North America. 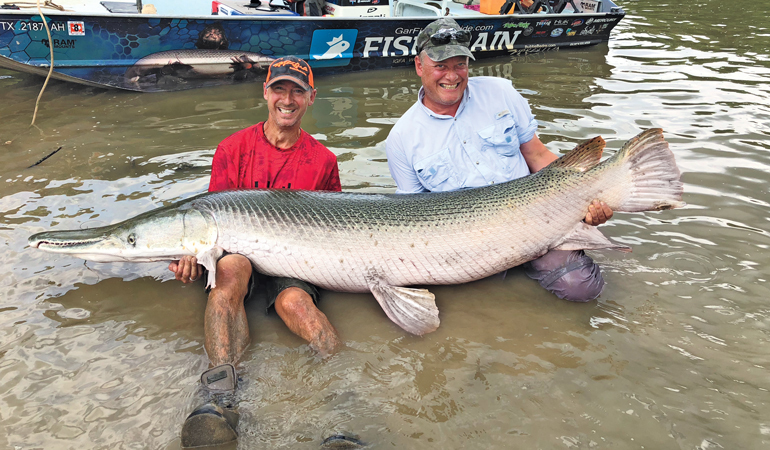 Anglers currently have the opportunity to catch these gargantuan fish throughout the southern United States, but they should do so with knowledge and respect for these rare treasures. Once hooked, alligator gar can make long, powerful runs, doggedly hug the bottom, bolt through submerged cover, tail-walk across the surface, and erupt at boatside with mouth agape and rows of prominent teeth in full display. Catching and releasing one of these magnificent giants is a momentous event for any angler. With proper management and good stewardship, these treasured fish can be passed down to future generations, or, they can be lost if we fail to recognize and protect them as one of North America’s greatest sportfish. Alligator gar over 100 pounds are caught regularly with the assistance of top fishing guides. Giant fish surpassing 200 pounds are safely caught and released or shot and killed on an annual basis, and true monsters topping 350 pounds almost certainly reside in remote areas of the Gulf of Mexico drainage. These fish not only possess unsurpassed size but also unique characteristics that set them apart from all other fish. They are a relic to the age of dinosaurs. Fossil records speak to their ancestry dating back more than 150 million years. That puts them in the Jurassic Period—existing side by side with the fiercest terrestrial vertebrates ever to roam the earth. They outlasted dinosaurs and survived environmental and climate extremes through the millennia, without any significant changes. Perhaps the greatest challenge to their continued existence has been humans during the last century. Hopefully, man can be their greatest proponent moving forward. From their appearance, one would think alligator gar are indestructible. They’re clad in interlocking ­diamond-shaped, armor-like scales. Their broad heads are as hard as concrete and can be wheeled like a weapon. They possess the gnarliest set of teeth of any fish in the Northern Hemisphere. Their upper jaw is lined with two rows of large teeth suited for grasping, puncturing, and ripping prey. Wrangling alligator gar is an all-in proposition. To help insure their survival throughout the ages, alligator gar have a vascularized swim bladder, which serves as a primitive lung. This enables them to gulp air from the surface in stagnant water conditions that contain insufficient oxygen levels to allow for adequate gill respiration. They also have primitive digestive organs that enable greater absorption of nutrients and may allow for a more diverse diet. Even their eggs are toxic, to reduce predation on them during the spawn. All these safeguards, however, were not enough to forestall their near or complete extirpation during the last half-century from much of their northern range, including Illinois, Indiana, Ohio, Kentucky, Tennessee, Missouri, and Arkansas. Once present throughout the lower stretches of the Ohio and Missouri river systems, as well as central reaches and tributaries of the Mississippi River, the loss of habitat due to the construction of levees and lock-and-dams, plus over-exploitation, resulted in the decimation of alligator gar populations throughout the United States. The few strongholds remain primarily in Texas and Louisiana, with lesser populations in Oklahoma, Mississippi, Alabama, and Florida. The decline of alligator gar populations didn’t go unnoticed. By the end of the last century, several states had listed the species as endangered or had taken measures to reduce commercial harvest of the remaining stocks. The federal government also granted them protection under The Lacey Act, making it a federal crime to engage in interstate commerce of alligator gar. These protections started at about the same time that the popularity of targeting trophy gator gar began to expand exponentially, especially among bowhunters. Notable photos of dead 7- to 81⁄2-foot gar hung by chains or rope high from trees or hoists flooded the Internet. The fish were impressive but the result was declining populations of large breeding-size female gar. Texas has the largest population of trophy alligator gar in the world, with the upper Trinity River above Lake Livingston the hotbed for fishing and bowhunting. In 2009, the Texas Parks and Wildlife Department (TPWD) reacted to the increased harvest of trophy alligator gar by imposing a one-fish-per-day bag limit. During that time, TPWD undertook extensive research efforts to help guide future management plans. Several area guides also took notice and worked toward better catch-and-release practices. Dan Daugherty, research biologist at TPWD’s Heart of the Hills Fisheries Science Center, shares some observations regarding their ongoing research efforts and initial findings. 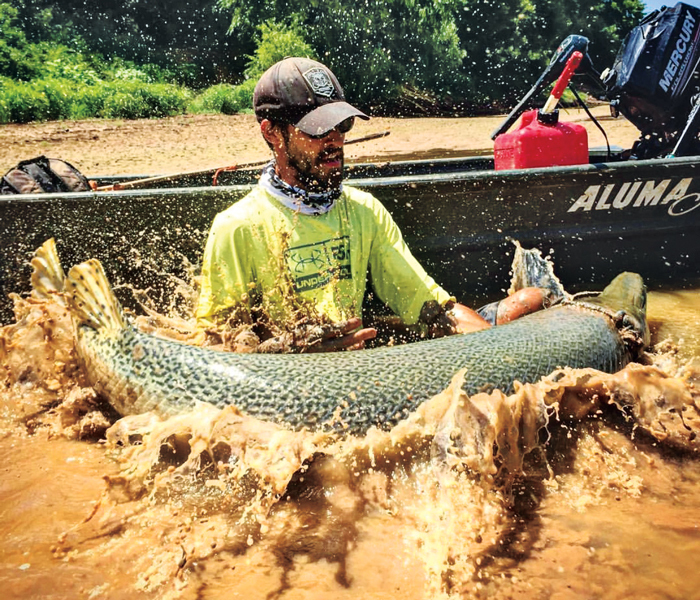 “Ten years ago, the existing scientific knowledge on alligator gar was very limited,” he says. “During my initial search, only 4 or 5 peer-reviewed articles showed up. By comparison, a similar search of largemouth bass would net 20,000-plus results.” The TPWD had their work cut out for them. 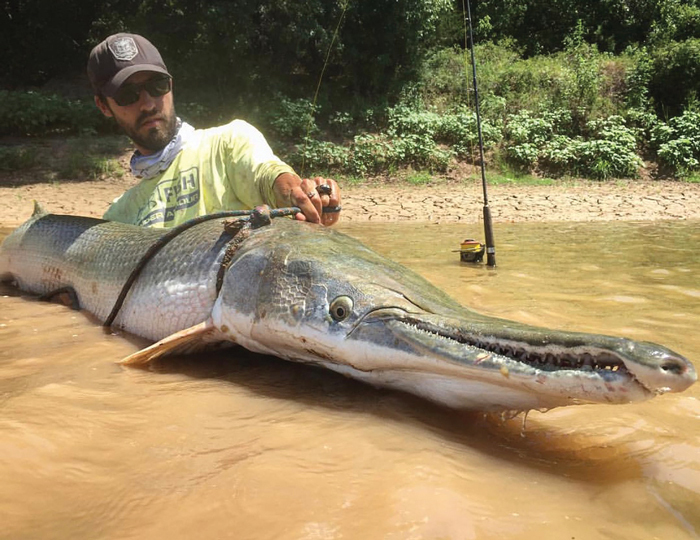 They needed a critical mass of data to devise informed management plans, but alligator gar are hard to catch and exist in low densities in limited, difficult-to-access fisheries. By working with guides and the fishing public, TPWD realized the tremendous interest in alligator gar in Texas. Daugherty says that when conducting online surveys of anglers on various topics, 200 to 500 responses is a typical level of participation by the public. When the issue of alligator gar management was presented, the survey drew more than 9,000 responses, and the TPWD estimates that more than 100,000 anglers pursue alligator gar in Texas annually. ✯ Alligator gar may take as long as 4 to 10 years to become sexually mature, with males maturing later. Most other fish species start reproducing by age-2, spawn each year, and many don’t live beyond 10 years old. ✯ Alligator gar are extremely long-lived, to nearly 100 years old in extreme cases. Females tend to outlive males. Few males live beyond 30 years, while females live to be twice that age. ✯ Trophy fish over 6 feet long are almost exclusively females. ✯ Alligator gar grow rapidly in length their first 3 to 5 years, reaching 36 to 48 inches within that time period but then growth rates slow dramatically to as little as a half inch per year. A typical trophy fish of 7 feet or longer may be 30 to 60 years old. ✯ Telemetry studies reveal that alligator gar are homebodies, moving less than 25 miles on large river systems such as the Trinity River. They rarely commingle and have distinct river populations. This suggests that localized regulations may be appropriate, as opposed to regional or statewide regulations. ✯ Greater numbers of alligator gar and more year-classes exist on lower stretches of Texas’s coastal rivers and bays, including the Trinity River, than in upstream areas, such as upstream of the Lake Livingston dam. Upstream of the dam there is a lower density of fish and fewer year-classes, but larger fish in general. Additional research is necessary to determine if alligator gar can spawn in brackish water where conditions may be more favorable on an annual basis, and if management strategies may be tailored differently between upstream and downstream populations. ✯ Alligator gar are opportunistic feeders, with carp, drum, and shad making up a significant portion of their diet. Gar eat bass and panfish, but not in significant numbers. Predation by gar serves as an important fishery management tool. Many of Texas’s finest bass fisheries, such as Choke Canyon, Falcon, Sam Rayburn, and Toledo Bend, have benefited from the presence of alligator gar. ✯ Alligator gar require over-the-bank spring flooding to spawn successfully. Only when flood levels and water temperatures are appropriate do they move onto the floodplain to deposit eggs over vegetation. Once fertilized, eggs hatch in 48 hours. Larvae remain attached to vegetation for an additional 2 to 4 days, prior to fry being transported to the river in receding floodwaters. Quickly dropping water levels forestall the hatching of eggs or survival of larvae, as well as strand and kill large spawning-age fish. Since ideal flood conditions do not occur each year, wide gaps in successful spawns occur, with corresponding gaps in year-classes of fish. A giant 40-year-old female gar may have less than a handful of successful spawns throughout its lifetime. ✯ Due to their long-lived nature and infrequent reproduction, alligator gar can only sustain an annual harvest rate of approximately 5 percent across all year-classes (not limited to trophy-size reproducing female gar). ✯ Populations of alligator gar exist throughout most of Texas’s coastal rivers, from the Sabine River on the Louisiana border to the Rio Grande, which forms the border with Mexico. Alligator gar guides offer insights into the current state of gar fishing in Texas, as well as their efforts to advance the preservation of the species. Bubba Bedre has been fishing for alligator gar his entire life. He grew up bowhunting them at an oxbow lake adjacent to the Trinity River, on land owned by his dad. Spring floods would regularly connect the oxbow lake to the river and keep fish trapped in the lake for the remainder of the year as the water receded. As a kid, his mentality was to kill every gar he saw. He figured the river would replenish the lake’s supply of fish each year. He eventually realized that there was a limit to the number of big fish in the system. Since alligator gar are homebodies and long-lived, they weren’t quick to be replenished. That led him to hang up his bow and guide anglers on a catch-and-release basis. He’s now refined his gear to heavy-power Eagle Claw Flats Blue Rods paired with a Penn Torque 7500 size reels spooled with 100-pound-test Spiderwire braided line. Another satisfied angler with a world-class gar from South Texas. Bedre has devised various systems to consistently catch trophy gar while minimizing damage to them. The first lesson he learned was to downsize hooks. The oversized treble hooks that he initially used routinely punctured the air bladder of gar when they swallowed a bait, causing delayed mortality after release. By downsizing to a 4/0 Trokar (Model 774M) treble hook on a piece of deadbait, mortality was reduced. Another option is to use a 9/0 Trokar J hook (Model TK15) and set the hook once the fish takes the bait. Anglers must not wait on fish to swallow the bait when using oversized hooks as it can do lethal damage to internal organs. He also has had success with extra-large circle hooks, but they’re cost prohibitive for many anglers, and if not used correctly, they can be a death sentence for gar. No matter the size or style of hook, he encourages the use of materials other than stainless steel, to insure that any hook left in the fish dissolves quickly. He says that with increased fishing pressure on the upstream stretches of the Trinity River and upwards of 18 guides now plying the river in search of 7- to 8-foot trophies, every angler must do their part to help the survival of fish that may be caught multiple times each season. He’s organized the Texas Gar Fishing Association, to help disseminate useful fishing information and sanction tournaments with protective rules to minimize harm to fish. Even though fishing pressure on the river has increased, his catch totals have improved as he refines his skills, implements new tactics, and covers more water in search of trophies. He also works with several other guides to increase their knowledge and stay current on multiple stretches of the river. Bedre also has begun catering to anglers looking for alternate styles of targeting gar, besides fishing deadbait on bottom or suspended under floats. He has a team of kayak guides ready to assist adventurous anglers looking for an up-close battle with these dinosaurs. He also guides fly anglers to IGFA records, by stalking monster gar in shallow water with nothing more than hair and feathers. The trick, he says, is to quickly retrieve large streamers directly in front of the path of gar without allowing them to smell the fly. He also enjoys the challenge of catching gar on artificial lures on traditional tackle. Henry Martin is a central Texas guide looking to expose anglers to these unique fish while preserving the resource. He uses a small jonboat to access remote waters and targets less-pressured trophy fish. To minimize damage to fish, he uses 4/0 Owner Aki J hooks that he bridals to deadbaits. He also doesn’t remove fish over 100 pounds from the water. Clients get into the water to get their photos taken with their fish. Although one-fish-per-day limits have been put on the books in Texas, Martin is concerned about lack of enforcement and illegal activities on the river. In the last five years, he says that multiple locations have been decimated by bow tournaments. “I’ve seen where hundreds of fish are killed in a single night,” he says. “On the Trinity River where good boat ramps are available, it’s become increasingly difficult to catch a giant. It’s now common to see people with 20 juglines out waiting to shoot any gar that eats the jugline bait. Kirk Kirkland, “the father of alligator gar guiding in Texas,” has been at the game longer than anyone. He’s seen ups and downs in the fishery in the last 30 years and has worked with the TPWD for many years on gar research projects. He heralds the one-fish-per-day regulation but acknowledges shortcomings in enforcement. As a guide on the river 200-plus days a year, he routinely witnesses dead floating gar that have been discarded, typically by bow anglers. He respects bow anglers rights to legally practice their sport, much like his own right to catch-and-release gar. His hope, however, is that people start valuing large mature alligator gar (a fish taking 30 to 60 years to achieve trophy status) at least on par with trophy whitetail deer (a 5- to 6-year-old animal). As such, restitution fines should be on par, or greater, for individuals who violate game laws concerning alligator gar. He also would like to see large fish managed on a catch-and-release basis, similar to long-lived and slow-growing white sturgeon in the Pacific Northwest, or on a one-tag-per-year system as done by states in the Midwest for paddlefish and lake sturgeon. In the context of hunting, he says there may even be justification to allow for the purchase of a second tag at locations that have sufficient populations of large fish. These regulations could be adjusted on an annual basis based on demand and the health of the fishery. More-prolific gar under 48 inches could remain under the one-fish-per-day regulation. Kirkland remains optimistic about the current status and future of the fishery. In 2018, his clients landed 11 fish over 200 pounds, including a 265 and 267. They also had more than 200 fish over 100 pounds—a benchmark for many anglers. He sees a bumper crop of fish from the strong 2007 and 2015 spawns. That means a lot of 25- to 50-pound fish in the system. Like other guides, he uses smaller 3/0 Mustad #3551 treble hooks or single 3/0- to 7/0-bait hooks, to minimize damage to fish. He’s also working to perfect a snaring technique to eliminate hook damage. He pairs his signature Okuma Record Chaser rods with Coronado CDX Baitfeeder reels spooled with 150-pound PowerPro. This heavy gear insures that big gar are fought quickly to the boat without being exhausted, and reduces the chance of breaking off fish. Alligator gar have harmoniously shared this planet with some of the fiercest creatures ever to exist. Hopefully they have not met their match in humans. During the last century, humans have likely done more to reduce their abundance and distribution than any other factors in their 150 million years of existence. Luckily, we have the capacity to step up and insure that alligator gar populations rebound in areas of overfishing and thrive in their remaining strongholds for generations to come. 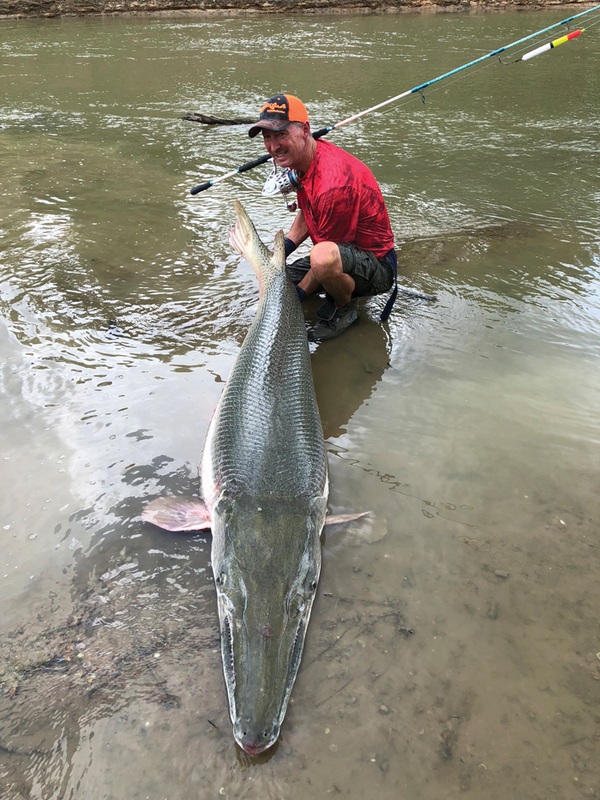 *In-Fisherman Field Editor Steve Ryan has fished the world in search of the largest species swimming in freshwater, including giant alligator gar.